Looking for a converter for RS 232, 422 and 485? 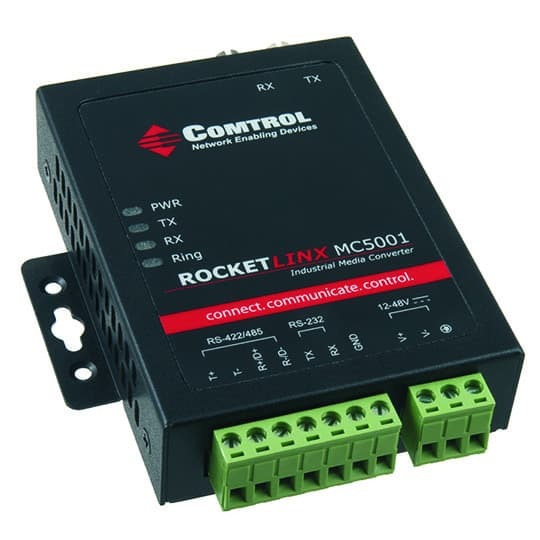 The RocketLinx MC5001 is designed to extend RS 232, RS 422 or RS 485 serial communications across a fiber media link using two converters and is a 1-port serial to fiber media converter. It features simple DIP switch configuration, an extended operating temperature range, and a large input voltage range. Cabling to the product is attached through direct wire screw terminal blocks for serial and power, and ST connectors for fiber connections. The product is encased in a rugged IP30 rated enclosure suitable for panel or DIN rail mounting. If you are looking to increase the number of connected serial devices, and extend transmission distance, multiple MC5001 units can connect to each other as a ring architecture in SFR (serial fiber ring) mode. The RocketLinx MC5001 supports two transmission configurations, Peer-to-Peer in half/full-duplex and Serial Fiber Ring (SFR) in half-duplex. With a Peer-to-Peer configuration, two fibers are needed between the two converters, one for data in both directions (RX and TX). 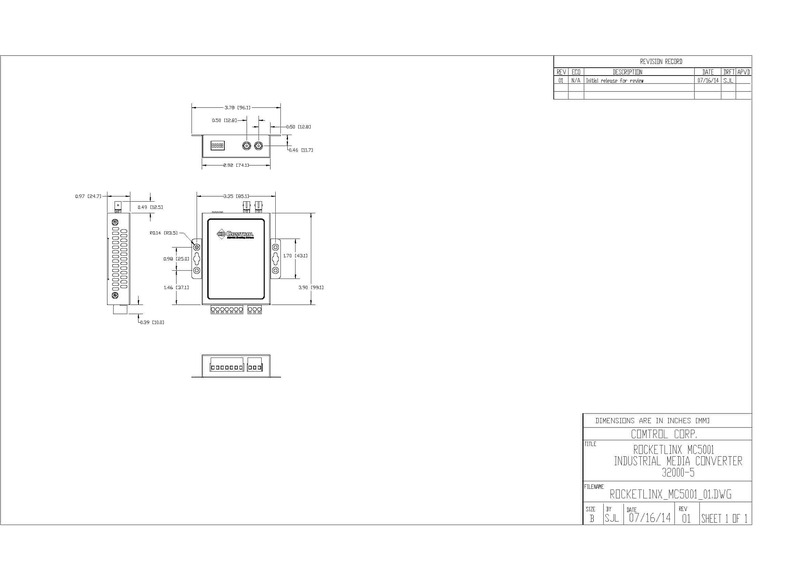 RocketLinx MC5001 - RS 232 Converter Product Specifics? For a full list of Hardware, electrical, environmental and serial, optical fiber specifications be sure to check out the specifications tab located at the bottom of this page. Download the product PDF for a full description of the RocketLinx MC5001. The RocketLinx MC5001 is a 1-port serial to fiber media converter designed to extend RS-232/422/485 serial communications across a fiber media link using two converters. This product features simple DIP switch configuration, an extended operating temperature range from -20° to 70ºC, and a wide input voltage range. Cabling to the product is attached via direct wire screw terminal blocks for serial and power, and ST connectors for fiber connections. The product is packaged in a rugged IP30 rated enclosure suitable for panel or DIN rail mounting. Single-Mode fiber optic ports meet the needs for long distance transmission up to 40KM. RocketLinx MC5001 automatically detects the data baud rate of the connected full-duplex serial device, up to 921Kbps.